It's a big, beautiful world! You know it. We know it. For most of us recreation in the outdoors is one of the best things about living in Seattle, but there are a lot of urban youth who never get to experience the natural beauty and wonder Washington State has to offer. Inspiring Connections Outdoors* (ICO) is an all-volunteer organization that gets low-income youth out of the city to experience and explore the great outdoors. ICO volunteers believe that the wilderness exists for everyone and that all people should have access to it. With the guidance of ICO volunteers, participants discover the beauty of wild lands and how to enjoy these areas without harming them. Young people learn valuable survival skills and strengthen their abilities to face challenges, both inside and outside their urban environments. Through active involvement with nature, the ICO program increases participant's environmental awareness. Interpersonal skills and self esteem develop as a natural result of teamwork and an active relationship with the outdoors. The trips are completely free to the youth participants. ICO provides food, gear, transportation, and leaders trained in first-aid, CPR, environmental education and youth leadership. ICO volunteers work through partnerships with selected elementary, middle, and high schools and social services agencies to enable underprivileged and at-risk youth living in the Seattle area to enjoy the natural wonders of Washington State. Our youth range in age from 8 to 20, and represent diverse ethnic and cultural backgrounds. Seattle's ICO program is in constant need of energetic new volunteers to drive Seattle youth to get active. Our volunteers give their time, sweat, and brilliance, to provide exciting learning and exploring opportunities for the youth. ICO stays successful by continuing to attract interested people with an active concern for our community's future. To learn more about volunteering with Seattle ICO see our Volunteer page. Read about Seattle ICO in the Seattle P-I and Horizon Air's In-flight magazine: Our Scavenger Hunt Fundraiser, a typical ICO trip, and Horizon Air magazine's profile. Cleveland is scheduled to have a gear locker cleanup date this month. check with team lead for date and time specifics. End of the Year gear locker cleanup date this month. All invited. date TBD. TBD - canoeing? mountain biking? horseback riding? Wallace Falls hike with students from South Shore elementary school. At the start of the hike there is a sign with a stanza from the poem The Tables Turned by William Wordsworth. Seattle ICO is a community outreach program providing opportunities for underprivileged and at-risk youth to explore, enjoy and protect the natural world. Seattle ICO began as part of the Washington State Chapter of the Sierra Club in 1991, and has grown to become one of the most active ICO programs in the National Sierra Club. The first ICO group was established in 1971 as part of the San Francisco Bay Sierra Club Chapter. There are now approximately 50 groups across the country serving thousands of participants each year. 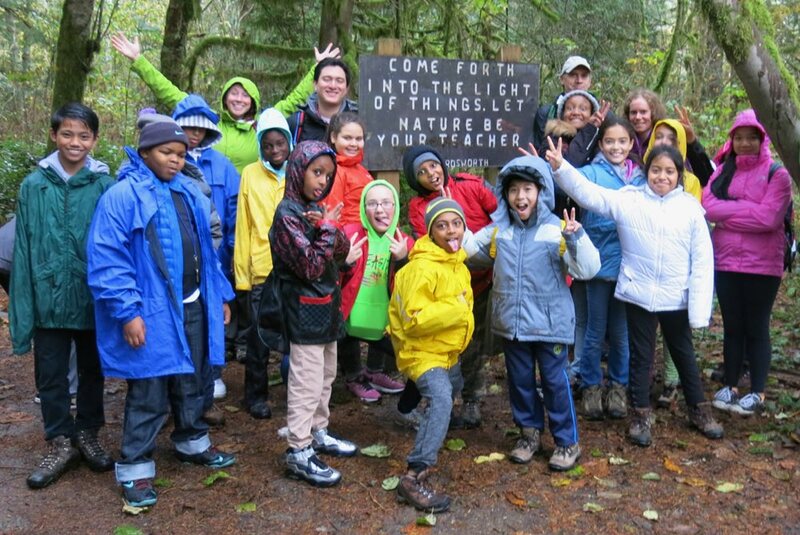 Seattle ICO operates as an all-volunteer organization in partnership with local schools/nonprofit agencies, serving several hundred of Seattle's youth each year, providing opportunities to experience, learn about and enjoy the outdoors.